This house of worship is home to a Jewish community called Romemu, the West End Presbyterian Church, and several other social service organizations. Read more about this creative space-sharing. Every Friday inside a historic church, there is a call to prayer -- answered by hundreds of Muslims, surrounded by Christian icons. Two religions sharing the same space. Farooq Syed has been organizing these Friday prayers ever since the Church of the Epiphany opened its doors to the Muslim faithful who needed a place to worship eight years ago. "It starts with people understanding each other," Syed told CBS News. "And then it grows to religions understanding each other." The prayers began with 50 people. Now there are more than 300 who pray each week, with the church's blessing. As a religious studies major who is passionate about interfaith understanding, and as an urbanist who is passionate about intentional, thoughtful use of space, this story thrilled me. I hope it becomes a model for other faith communities, and encourages the opening of doors for better use of space, as well as new friendships. WHAT'S THE POINT OF SPACE-SHARING? Space-sharing cuts down on the need for redundant infrastructure and decreases costs for everyone involved. For example: Suppose a martial arts teacher wants to run classes in the evenings for residents in his town, but he’s a small business owner and can’t afford to rent a large training space in the downtown. He could either find an office park or strip mall in the suburbs and rent that space for a price he can barely afford, requiring his students to drive miles out of town to get to classes. Or he could negotiate with a local Unitarian Church in the center of the city that has a large basement space that’s currently completely unused most weeknights. By choosing the latter option, his students can easily get to class, he saves money on rent and the church has an additional source of income. Here's another example that I've seen in action several times: A choir director or orchestra conductor has assembled a community music group that needs a large space to practice and store instruments. They only practice a few times a week, so renting out an entire building for those rehearsals would be absurd, and this is a community group so it's mostly volunteer-run with a tiny budget. Instead of renting a space solely for their practices, they could approach a local synagogue whose large service space is only in use on the weekends, and already has a piano to boot. For a small fee (or maybe in exchange for a few free concerts every year), this community music group can rent out the space that suits their needs, requires little set-up and puts an otherwise empty room to good use on weekday evenings. In addition to saving money and making use of empty space, as we saw with the initial story about a church sharing its building with a Muslim community, space-sharing also has the potential to create new friendships and build new bridges of understanding. Perhaps female members of the Unitarian Church I mentioned above would now have the opportunity to take self-defense classes with the martial arts teacher. Perhaps members of the music group are able to meet Jewish neighbors they might not otherwise have gotten to know. It might take a little creative thinking and legal maneuvering (if there are zoning laws, insurance policies, etc. to work around), but in the end, these are economical, productive uses of space. Houses of worship have been sharing their spaces in myriad ways for years: It’s hard to find a church that isn’t hosting AA meetings every week in its space. Small schools are also a common space-sharing option for houses of worship. My own church hosts a daycare during the week. 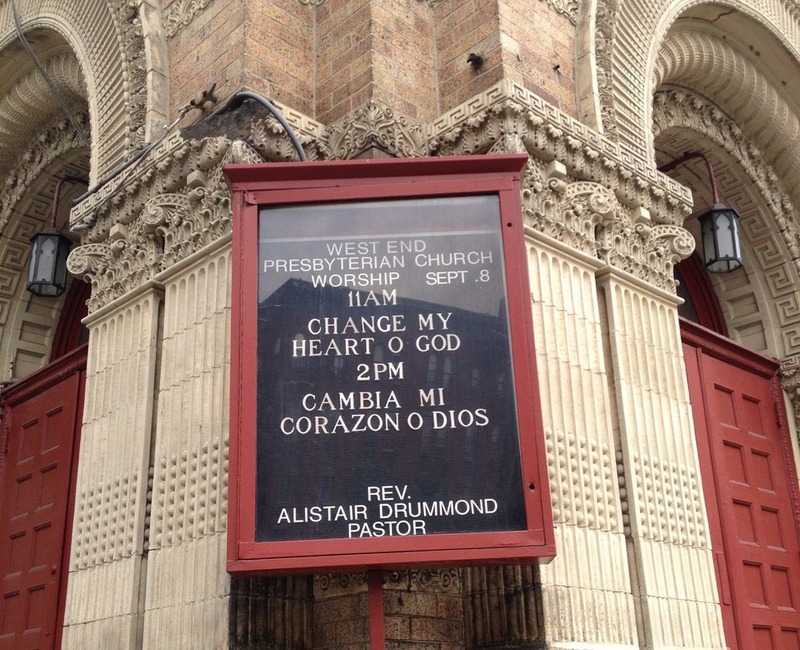 Other houses of worship open their doors for community meetings, concerts and more. There are also the space-sharing initiatives that are run by the religious community: food pantries, homeless shelters, counseling centers, after school programs and more. Because most of the space in houses of worship is typically only occupied during certain days and hours (Friday afternoons, Saturday mornings, Wednesday evenings, etc. ), this is a no-brainer. Sure, maybe the synagogue’s administrative offices are in use during the week, but what about the rest of the building? What about the parking lot? Could those be rented to a local business or offered to a local school? Houses of worship are in a unique position to open their doors because their spaces are usually large and varied with some mix of smaller classrooms/offices, kitchens, and big gathering areas. Some have playgrounds, gardens or even living quarters. Churches, temples and mosques are also often situated in the heart of residential neighborhoods, making them especially suited to catering to community needs. But other organizations could creatively employ some of these space-sharing tactics too: an office building that empties out at 5pm could provide rooms for therapy sessions or adult education classes in the evenings. A restaurant that does most of its business at night could allow a baker to rent the space in the morning. A school that’s closed in the summer could offer its space to summer camps and sports leagues. An office parking lot could be used as a farmers market or food truck space on the weekends. I’ve seen examples of all of these things before. The suburban development pattern and modern zoning has instilled in us the idea that every building and neighborhood must have one use and one use only: Homes are where we sleep and eat. Offices downtown are where we work. Churches are where we go on Sunday mornings... But it doesn't have to be that way. Space-sharing is something every faith community (and business owner) should consider, whether on a small scale—like renting out an office or two—or a big scale—like opening your space to another religious group, musical organization, etc. The potential to save on costs, meet new people, and make great use of a valuable asset is high. We are raising a generation of consumers to which even our zoning codes cater. We want unlimited options. We want the cheapest prices. And, we want convenient access to all of it.